The builders have dug a hole in the ground to be filled with concrete for the foundations of our garage. How many cubic metres of ready-mix concrete should the builders order to fill this hole to make the concrete raft for the foundations? A plastic funnel is used to pour liquids through narrow apertures. Have you ever tried pouring a drink from a glass back into a bottle ? If we imagine a funnel as a complete cone (why isn't it? 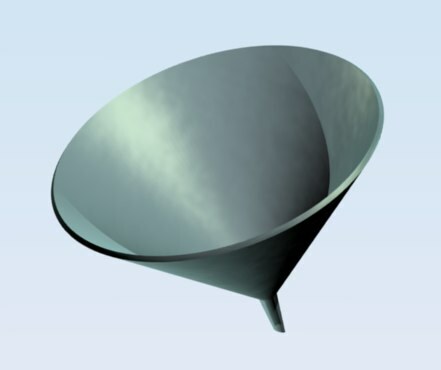 ), what shape cone would use the least amount of plastic to manufacture a funnel containing a set volume? You don't need a specified volume, but it may help to ask what proportion cone would hold a litre of liquid using the least amount of plastic. See the Hint for more help. Experimental probability. Coordinates - 3D. Scalar products. Spheres, cylinders & cones. Physics. Spreadsheets. Non Euclidean Geometry. Surface and surface area. Volume and capacity. Maths Supporting SET.